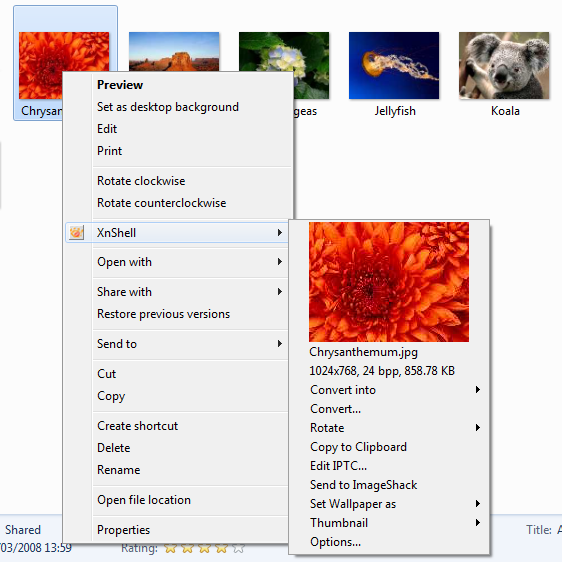 XnView shell extension allows for viewing a thumbnail of the selected image in the context menu of MS Explorer. The XnView Shell extension can be downloaded on the XnView Download page. Seems to be missing one tiny little thing -- an "Open with XnView" command. Considering how many people using Windows suffer from what I call the "disappearing 'Open With Application' phenomenon," a shortcut, workaround, easy-open option, however you'd like to phrase it, would be a big help. Perhaps not 100% obvious: Clicking on the thumbnail will open up the image in XnView. Is this what you request? Ahem ... that presumes you have XnView set as the default application to open or edit the type of file you're previewing in the Win Explorer context menu. I don't, and I'm sure I'm not the only one. Prove it to yourself: take a less-often-used image file format such as TGA or TIFF and set the default application to a program not XnView. Then try opening it via the preview displayed by the Shell Extension (if there is one). It 'reverts' (for want of a better word) to whichever application you just set for that format. I still vote for a menu command "Open with XnView". Some of us would rather not gimp (npi) around with our file-format options, but may still from time to time want to see the picture file in full-size and have the greater number of options available in XnView (as opposed to, say, My View Pad or QuickTime's PictureViewer). I think I remember the "open with xnview" being removed because it is assumed that XnView is the system default. Yes it could put back again in a next release. If I only want to use the shell extension can I only install that or must I first install xnview & then the shell extension? Also is the rotate a lossless rotate for jpg? Looking through some of the FAQ's it appears to be lossless. True? Maki wrote: If I only want to use the shell extension can I only install that or must I first install xnview & then the shell extension? How can I get XnShellEx supporting a custom image ? I have a plugin for XnView to display a custom images it works fine. But using XnShellEx i have just this " XnShell: File's Icon..." and no contextual menu! What do you means by custom image?? Do you have installed XnShellExt 64bits? I have a kind of yuv images on which i encode a small header containing width, height and yuv format type. Do you have your plugin in 'Plugins' folder with XnViewShell.dll? xnview wrote: Do you have your plugin in 'Plugins' folder with XnViewShell.dll? I have 'MyPlugin.usr' in Plugins folder, but the 'XnViewShellEx.dll' is in another XnView folder named 'ShellEx'. Also, when i try to save others image format into my yuv format, I only get the function 'gfpGetPluginInfo' called by XnView which diplays unknown file format!! Maybe there is a link between those two issues or may i missing somethings? could you try to add Plugin folder with XnViewShellEx.dll? great!!! it works. thanks pierre. But, i didn't succeed to get xnview calling 'gfpSavePictureIsSupported', 'gfpSavePictureInit', and all other exported functions related to save method. thank you pierre for spending time to answer my questions.